Hi-ho, readers. Today, I want to talk about one of my favorite reads. 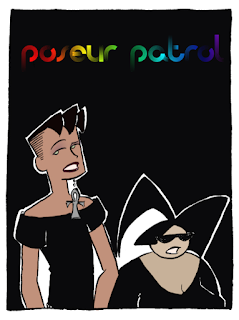 A webcomic called Poseur Patrol. It's about the Gothic subculture in the 90s. This awesome webcomic was created by Merrily Duffy and Jaycee Baron. They're the minds behind Black Fairy Press. A publishing company that deals with comics for lovers of subculture, music, and fantasy. I love reading Poseur Patrol. I like how it pokes fun at poseurs, and promotes individuality within the goth scene. Also, if you look hard enough, you'll find a few references to some popular films and songs.